Wild Thing slot has no reference to the famous 1960's hit by The Troggs, later covered by Jimi Hendrix. In fact Wild Thing was occasionally a show closer for Hendrix, where his Fender Stratocaster would normally end up in flames. It's a shame the game isn't built on this particular theme, as we could do with some excitement from Novomatic, whose slots tend to be quite basic, normally including only one feature. 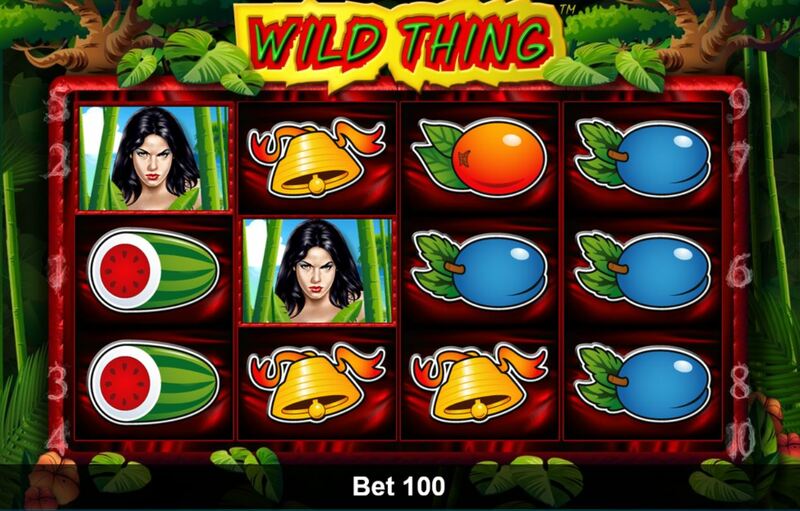 In this case of Wild Thing, this slot is built around around a vampish female character in among some stacked fruit symbols. You get the usual Novomatic tune when the reels spin and stop. In fact we've even lost a reel too, as the game is played over 10 pay lines covering 4 reels of 3 rows! 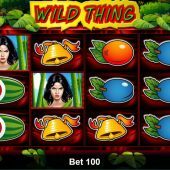 Wild Thing slot consists of stacked fruit symbols like the orange, melons, lemons along with some higher symbols such as 7's and stars which don't appear stacked 3 rows high. So you pretty much have a Power Stars set up with adjacent pays, in this case right-to-left as well as the usual left-to-right. In actual fact you get 5 lines either side, but the 3 horizontal rows also offer the chance of 4-of-a-kind wins. Should you get one, the best is the star at 100x stake and the the 7's at 40x and then the first symbol that allows the possibility of multiple lines, the melon at 20x bet. The lowest pay 4x stake which are the oranges and plums. There is a stacked Wild symbol on reel 4 only, and should any part of this Wild appear and not produce a win, you get one free respin in which you may or may not get a win. This leaves us with the Wild Thing lady symbol. You can land either 3 or 4 Wild Thing scatter icons anywhere in view to trigger 10 or 20 free games respectively. The enhancements are that firstly the stacked Wild stays on reel 4 becoming a Wild reel and secondly it will also substitute for the scatter thus increasing the chances of another 10 or 20 free games. And that's it.